Whether you need an annual flu shot or a series of vaccines for an upcoming adventure, stop by The Medicine Shoppe® Pharmacy for a convenient way to protect yourself against various diseases. Our pharmacist has been certified by the American Pharmacists Association to administer immunizations right here in our pharmacy. We offer CDC-recommended immunizations that may include influenza, shingles, pneumonia, and vaccines for international travel. We can also help your child get the required vaccines for school. 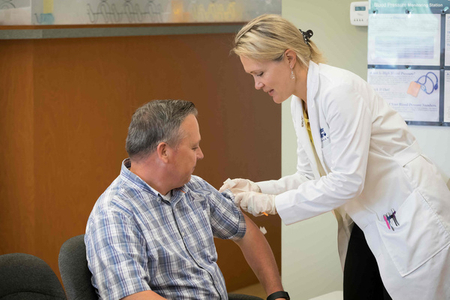 We make it easy for you to keep up with routine immunizations because we want you, your family, and everyone in the community to be at their best. Stop by to see our complete list of offerings.